I bought this truck at 140,000 miles from a car lot. Was kinda iffy buying a dodge but let me tell you. Best Buy I have ever made. This is the toughest truck I have ever owned. These trucks are almost indestructible! Mine has 234,000 now and it’s still going STRONG!! No major repairs at all yet. Doesn’t use a drop of oil. Still got all the power, transmission shifts perfectly, I love it! Very reliable. Well worth every penny. Superb service, non pushy salesman, great atmosphere, perfect for families. Made buying a car super easy. Highly recommend this dealership to other buyers! Very happy! My experience at iDrive Utah was the better end of the spectrum when it came to my experiences with the used car market. The buying process is a 50:50 split between buyer and seller. My salesman Angelo was nothing short of being a great salesman. I had to be sure the truck i bought was worth the drive from Portland, Oregon to iDrive sight unseen. He was quick to respond, answered all of my questions, got me all the pictures and accomodated my request for items on the truck. When he did not have the answer for me he got me the answer i needed quickly. I had to expedite my process and rush them to get the truck ready, showing up a day earlier than planned which was the next day after beginning the paperwork process. Angelo was able to get the items I requested done in what was looking like an impossible timeline. Once I arrived i did my test drive, and looked over the truck at some areas not pictured. We noted some blemished areas and areas of work. This is where most peoples experiences takes a turn. the 50:50 part comes into play when the buyer (me) is unreasonable, uneducated, doesnt know what they are getting into, and thinks they are buying a new vehicle when they in fact are looking for the deal of a century on a used car. I knew exactly what I wanted, what it would take through the first 6 months of ownership to make the truck 100%. I knew the value of my trade in and the cost it would take to make it 100% as well. With that being said I told them a number that i saw would benefit them and myself that would mean no hassel no bartering. At the end of the day there is only so much the buyer and seller can control, they have to make money and you need a fair price. My advice to a future buyer is do your research, know the problems associated with the specific vehicle you want to buy, research cost of oem replacement (FYI-you do not ask for price adjustment based on aftermarket parts to upgrade the vehicle, only parts to make it 100% OEM), and look at the vehicle history, does it have service records? how many owners has it gone through? What is the mileage per year look like? Was it evenly spread across its life? These are the questions thay you need to ask and look at when buying a USED vehicle. These questions make your buying experience the best it can be. The more educated you are the better deal you will get and the less the Dealer will fight you. My take away: This is a newer dealer/location, the trucks and vehicles on the lot are visually at a glance clean and nice. 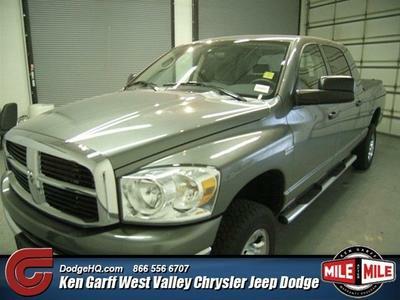 Most had newer wheels and tires, not wrecked with tons of body damage (again these are USED TRUCKS and they get used, dented tailgates and scrateches are impossible to avoid), salesman are presentable, work together, friendly and accomodating. When I brought up the few issues with the truck they were willing to meet my numbers (because they were reasonable) and I was able to leave with the truck I wanted with the budget I needed. Daniel is awesome! Member service skills are through the roof! You guys are great! Thanks!! Nick and Russ were wonderful to work with. I only had so much money and a car that I wanted and they made it work. No pressure, great personalities, and I felt confident as a female, by myself, making this deal. This is my 2nd one of the same model and has been proven to be a very reliable truck! It gets through any weather with its 4 wheel drive and I trust it to keep my family safe. I even took it on a soft sand beach where only 4WD vehicles were allowed and it was awesome! You never know how much you need a truck to do things until you don’t have one. This would a great local work truck or for your child’s first vehicle to help keep them safe. This is a very reliable truck. I have experienced plenty of power and towing capabilities. The leather interior is very comfortable, and excellent condition very well maintained. Rides very smoothly and definitely gets the job done.